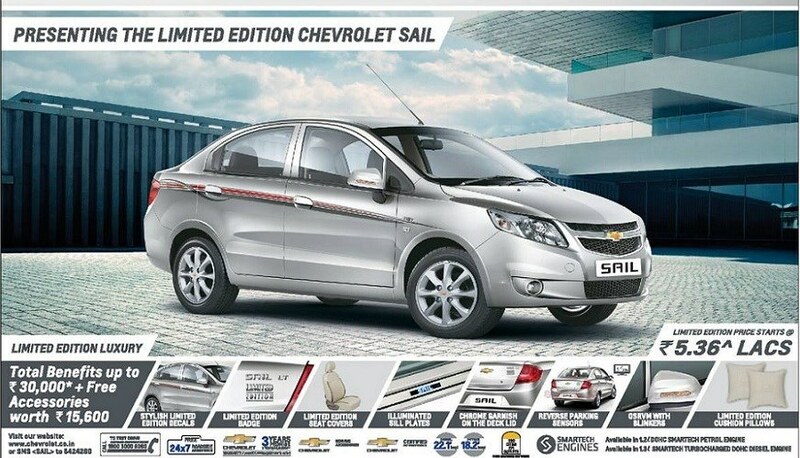 Chevrolet has launched limited editon of its two cars, Sail and Sail U-VA. Both the cars created a lot buzz in the Indian market after their launch in 2012. However, inspite of having good space and frugal engines, the cars couldn’t do well in the Indian market in numbers just because of no ‘attractive’ looking interiors and the cheap feel of the plastic parts. In addition to that, features offered by the competitors made this car look a generation old. The company is trying to keep up with the market pace and introduced a limited edition of its MPV Chevrolet Enjoy. 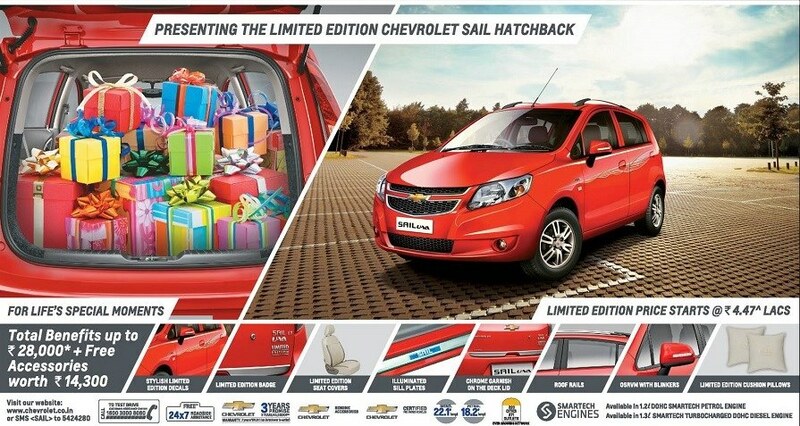 Soon after Enjoy, the company has launched limited edition of its two cars, Chevrolet Sail sedan and Sail U-VA. So what do you get in Sail U-VA limited edition at a price of 4.47 lakhs? Sail limited edition is priced at 5.36 lakhs, that offers two extra add-on’s than the above mention list and those are rear parking sensors and body graphics. Under the hood, there is no change and both the cars are offered with same engine options. A petrol motor is 1.2 liter that churns 85 bhp and 113 Nm of torque and the oil burner is 1.3 liter 78 bhp and 205 Nm of torque. Both the engines are mated to 5 speed manual transmission and Chevy may add an automatic manual transmission on these cars in facelift model. Chevrolet also introduced mega benefits on its car lines for the month of Feb. Chevrolet is offering discount that ranges from Rs. 40000 to Rs. 56,000 on various Chevy cars. Facelifts of Sail is doing testing rounds in China and the car is expected to hit Indian market by end of this year. As per 4wheelreviews sources, the facelift of Chevy Sail and Sail U-VA will have better quality of interiors and few premium features like AC vents for rear passengers. Chevy also has plans to launch the subcompact SUV ADRA that was showcased at the AutoExpo 2014. The company recently unveiled its smallest engine of ECOTECH series which is in competition with Ford’s 1 liter EcoBoost.